It's become an accidental tradition that on my good friend's birthdays, I bake them an awesome cake. Every time I go all out, trying something new and pushing my limits. 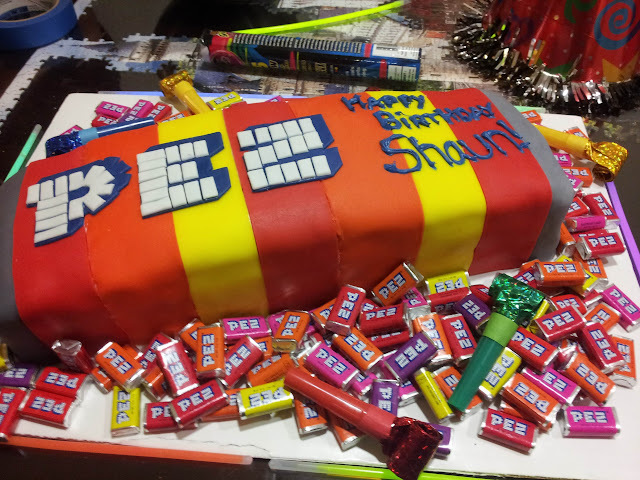 This time I decided I would learn how to use fondant and decorate a Pez themed cake for my Pez obsessed friend. As I was unable to find a simple guide to my liking for working with fondant, I've decided to write my own. I cheated a little bit and used premade fondant and box cake, but considering the amount of time I spent decorating.. I feel justified in those decisions. I dyed the fondant, baked the cake, assembled and decorated across three days, spending a total of about 12 hours. Keep this in mind if you plan to follow my footsteps. I'm breaking the cake creation process into a few posts, one for each evening that I spent working on it. The first night, excited to play with something new, I dyed the fondant. 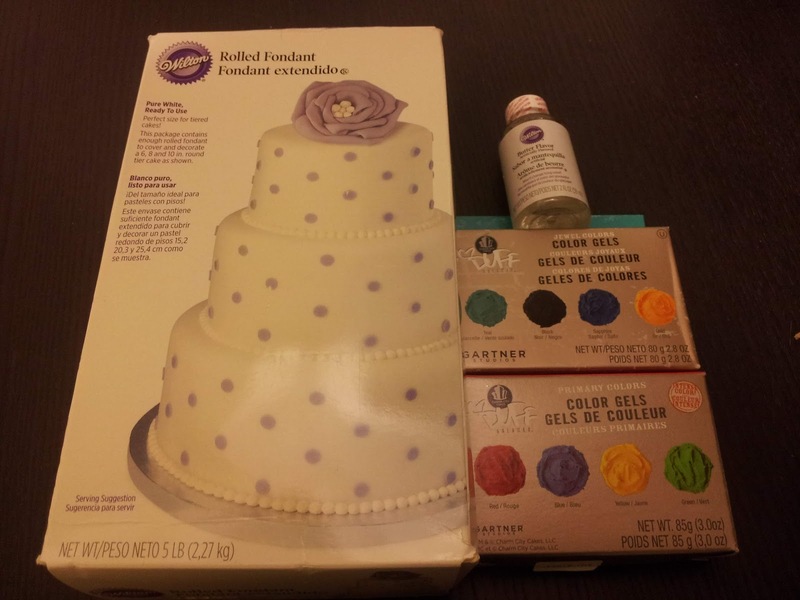 I wasn't sure if you could, or should dye the plain white fondant available at most grocery stores (and Michael's). The box doesn't mention anything about it and they sell colored sets, so I figured once if was made, you couldn't fuss with it. 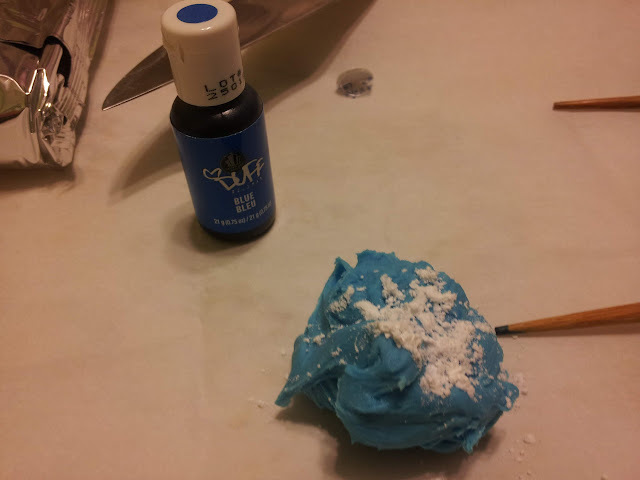 Then I did some research on Wilton's site and found out that not only can you dye it, but you can flavor it as well! The process for both dying and flavoring is straight forward. 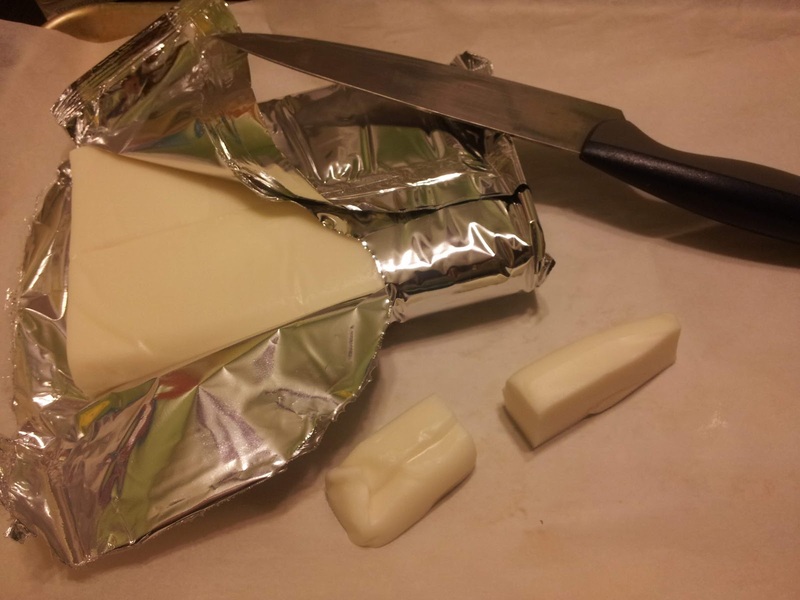 First, open your white fondant and cut off a chunk that you wish to dye. 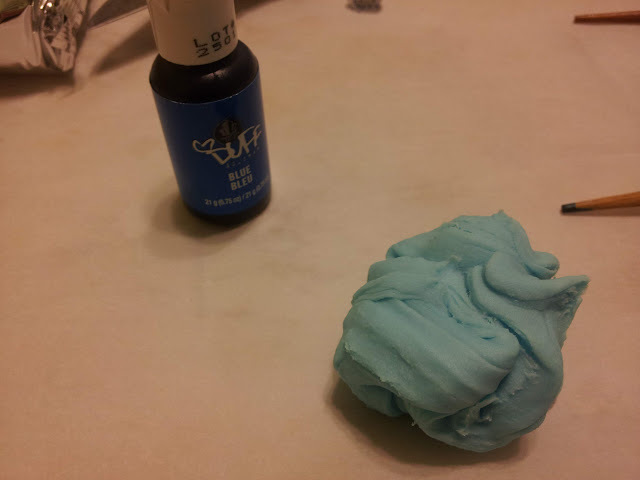 Then, using the toothpick (read: chopstick), dot the chunk you want to dye with the color gel. Don't over do it, as it's best to work the color in gradually to ensure you get the shade you want. Take the block and start stretching and kneading it into a maleable mass, working the color in as you go. If you use too much color to start, you'll likely end up with a bit on your hands. Work the fondant until all the color is mixed in (you shouldn't see any varying shades of white or color). 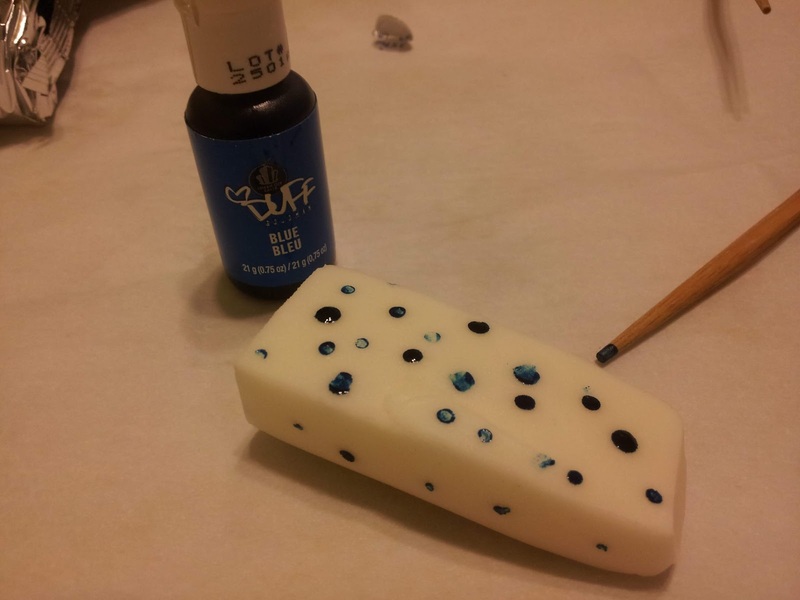 If you haven't gotten the shade you want, add more dye and work that into the fondant. After you work the fondant for awhile, you'll notice it start to get a bit sticky. This is partially because of the warmth from your hands and partially from the liquid dye you've added. Go ahead and add some powdered sugar to make the fondant more solid. Work it in like you do the dye. If you add too much powdered sugar and the fondant becomes crumbly, you can counter it with some water. Not a lot! A little does a long way. Keep adding dye, powdered sugar and water until you get a shade and consistency you like. To add flavor, follow the exact steps above, but with your taste buds testing the level instead of your eyes. 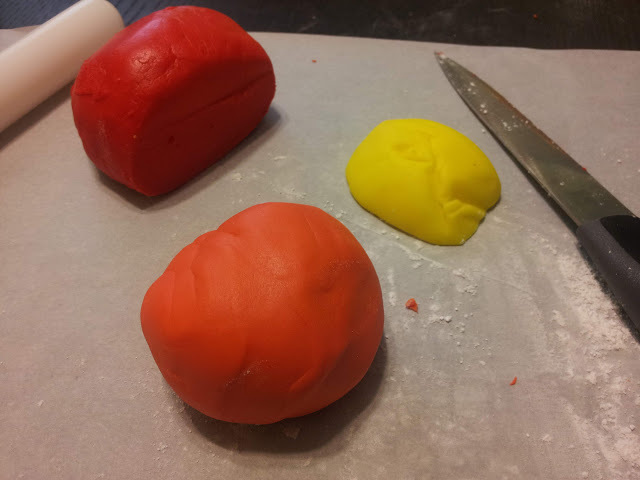 For some secondary colors, you might find it easier to dye some fondant in the base colors and then mix those together to make the secondary. For example, to get orange, I first made some red fondant and some yellow, then mixed them together. Once you've got all your colors dyed, seal them in an air-tight container and put them in the fridge to help stiffen the fondant once more. 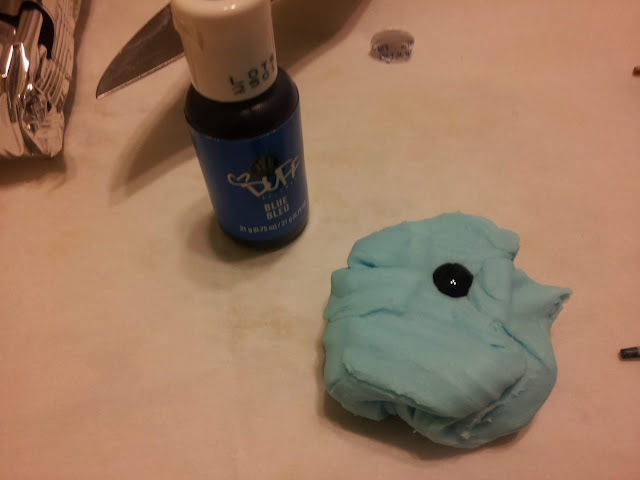 Dying my own fondant was a lot easier than I expected, and I saved a lot of money over buying pre-dyed fondant. I definitely dyed way too much, but that's okay.. I'm sure I'll think of something to do with it all. 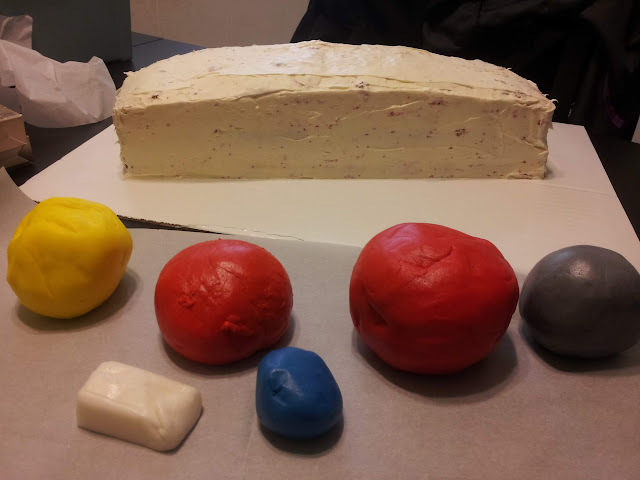 Next post will cover assembling a tri-level cake and preparing it to be covered with the fondant!